I was lucky enough to be offered the opportunity to review a baker days letter box cake, and i jumped at the chance. There is nothing better than cake, and getting cake through your letter box, how cool is that? Baker days have a massive selection of cakes for various different occasions. Birthdays, new baby, wishing someone luck, a christening or even a cake just to say thank you. With mothers day coming up they have a selection of different designs, it was so hard to pick one because they are all so lovely. Sam picked the design for me from Emily, which was a lovely thought and it meant I didn't know what it looked like until it came through the door. All of the cakes can be personalized with a message or photograph. The thing I loved the most was as the title suggested the package fits right through your letterbox, It is so convenient and also means that you are not waiting around all day for a package to be delivered. It also means if your purchase a letterbox cake for someone as a surprise gift, you wont have to worry if they are in or not. Cake through the door, can life get better than that? I waited patiently for the cake to come, and I really wasn't disappointed. It came in the cutest little tin, with a card, and some love hearts which I thought was a nice touch. I was worried that the cake might get a little squished so it made me a little hesitant to open the tin, but I shouldn't have worried. It was perfect, the tin had little holes in the lid so that the cake could breathe, it also stopped the cake from sweating. Inside was the most perfect 5" cake with a little message from Emily. 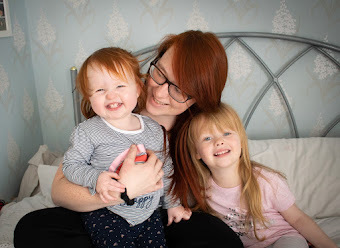 It was such a lovely touch and it made me well up, considering it is going to be my first mothers day. There is a small piece of paper coming from the bottom of the cake which allows you to lift it out without ruining it. When i looked at their website I saw that they offered 5 different flavours. Vanilla sponge, Chocolate chip sponge, fruit cake, gluten wheat free and dairy wheat free. To our delight we were sent the chocolate flavour cake, which is my favourite. Before opening the cake I could smell it, and it smelt gorgeous. I couldn't wait to try it, however I was a little torn because the design was so pretty that I didn't want to cut it. The cake itself was really moist and tasted amazing. I did find the icing to be a little bit sweet for my liking, but combined with the cake it was lovely. 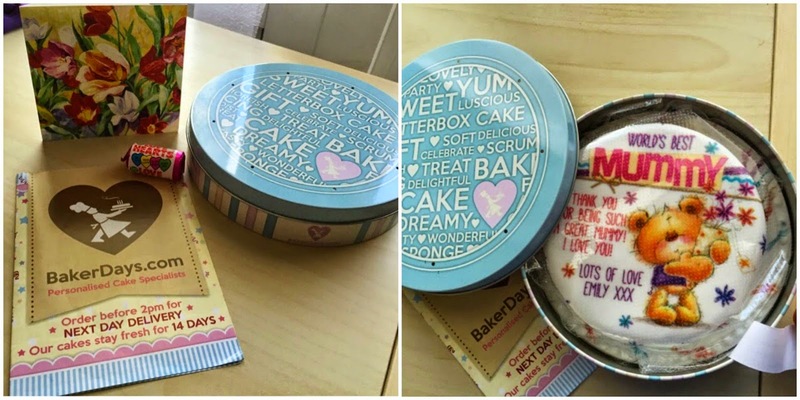 Baker days letter box cakes are £14.99 with free postage within a 7 day delivery period. If you need the cake sooner you can pay the additional postage. This price is for the standard sponge cake, depending on your filling adjusts the price of the cake slightly. Overall we loved the cake, I would definitely recommend baker days to friends and family. I'm even looking at purchasing one for Emily's nanny for mothers day. I do think that £14.99 is a bit pricey for the size of the cake, However the personalized touches and convenience make it worth it.